The Cow Milk Express is a latex agglutination test that allows to detect, in only 2 minutes, the presence of cow’s milk in goat’s and sheep’s milks. The test is based on the specific detection of bovine beta-lactoglobulin (BLG) in the sample using a specific monoclonal antibody. Thanks to the resistante of beta-lactoglobulin to thermal denaturation, the Cow Milk Express allows to detect the presence of raw cow’s milk, but also pasteurized and sterilized cow’s milk. This makes the Cow Milk Express the only rapid test currently available on the market for the rapid detection of adulteration of milk using heated cow’s milk. 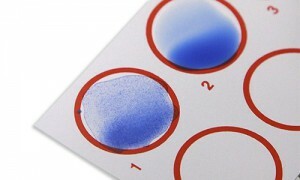 The Cow Milk Express can also detect the addition of bovine milk and whey powders in the sample analyzed. Detection limits are 0.25% of raw cow’s milk and 1% of sterilized cow milk in only 2 minutes.The Cow Milk Express is intended for whole, semi-skimmed and skimmed milks as well as for whey. IDBiotech renews partnership with CHARM Sciences Inc.